A donation box is a phenomenal way of raising funds and you can multiply your funds raised by simply having multiple boxes! But to really make your box a success there are a couple of guidelines you will need to follow, which we'll get into further down!!! Your Boxes don't only have to be for cash donations either. They can also be for clothes, food, toys, etc., depending on your cause and what you are fundraising for. As long as your cause can connect on a basic level with people in terms of it being "a worthy cause to donate to". Place your boxes in high traffic areas. The more people who see the box, the more donations you'll receive. Place near cash turnover points. Places where people have their wallets out and are receiving change. Catch people's attention. 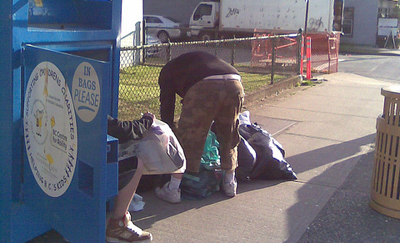 Make your Donation Box stand out so that people notice it! Get eyeballs onto your box! Have a short blurb that lets people know what the box is for. Just to connect that little bit more and encourage people to get their change out! Include QR Codes in your Blurb for people who want to Donate Online. Use a Transparent Box. 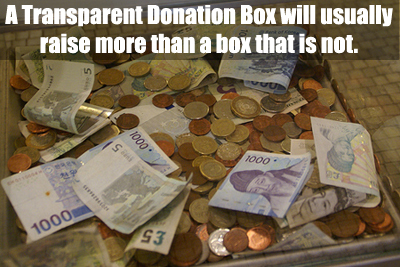 Nonprofits have found that transparent boxes receive more donations. Why? Because people can see that others have donated already!!! Use a Donation Stand with a representative. Donation Stands outside stores are a brilliant way of acquiring donations, and also building relationships with people. Just make sure your rep is active with the crowd and doesn't sit in his seat all day waiting for the box to full up! You can also have surveys ,or quick full sheets for donors details, that you ask supporters to fill out. Helping you grow your future fundraising contact list! So we've already discussed that this is the most important part of your Donations Box's success, and I've mentioned that High Traffic areas and Cash Points are the best locations. 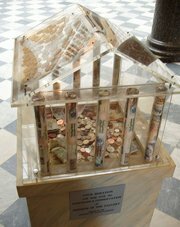 Churches - People are encouraged to give to charity at Church, so it's the perfect place to have your box! Remember though that you will need permission to have your boxes at all these locations. Your members will need to visit the locations you decide on, and get permission from the owners or managers. Always have a box (or boxes) with you when getting permission so that you don't have to make a return trip. You can control where it gets placed to increase donations! You must also always look for new locations for your boxes! The last thing you'll need to do is collect your donations on a weekly or monthly basis. Either do this yourself or send a trusted board member or volunteer. You'll then obviously count your donations... but you will also want to carefully record your results to analyze which boxes and locations work the best. You can then use this information to increase your low performing boxes, and to find more and better locations! Where to get your Boxes From? There are loads of stores that make Donation Tins, Cans, and Boxes! You will likely be able to find a local manufacturer that will make your boxes at a reasonable price. You can also incorporate your donation boxes into your Online Donations campaign through QR Codes. A QR Code (Quick Response Code) is an image that if a Smart Phone scans will load a specific webpage on that Smart Phone. This means that you can place a QR Code on your Box that will take people directly to your Online Donations page. If you setup a Crowdfunding/Donations campaign on this platform, a QR Code is automatically generated for your Campaign Print. Or if you use a DoJiggy Charity Donation page, you will need to find a QR Code creator to create a code or multiple codes for your donation page and boxes!